Texas Dental Specialists provides gentle, family oriented general dentistry care to the adults and children of this community. In addition to general dentistry and cosmetic dentistry, we have specialists in Periodontics (gum diseases, Implant dentistry and gum surgery), Pedodontics (children’s dentistry) and Orthodontics (traditional braces and Invisalign). With our general dentistry and cosmetic dentistry team we emphasize comprehensive care, quality and preventive dentistry – all in a single location for your convenience and comfort. Preventive maintenance to maintain good oral health. Early diagnosis and treatment is critical to surviving oral cancer. Gum therapy, is a treatment for anyone who has gum disease. We get you out of pain fast by extracting your diseased tooth. A implant is the preferred solution to replace a missing tooth. We provide comfortable, lightweight, stable dentures. We provide the sedation type appropriate to your dental needs. We can replace or repair broken or missing teeth, bones, or tissue. Your search for a general dentist in Plano, Frisco, or Allen that you can trust to take care of your preventative and general dentistry needs ends at Texas Dental Specialists. Dr. Christopher Cassidy is a general dentist with a strong focus on cosmetic dentistry. 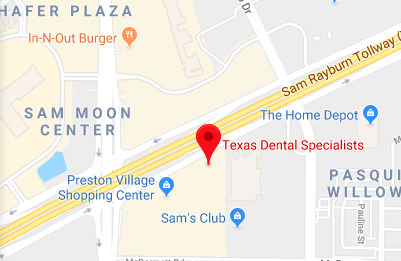 Texas Dental Specialists is located across Highway 121 from Stonebriar Mall. Our office is near the corner of Preston and Highway 121 behind McDonalds and On The Border, and is accessible via all the major roads. Our friendly and competent staff is dedicated to patient comfort and quality of care. We provide the best and latest in dental technology and treatment options to solve all your general dentistry needs. If you do need work done, there’s no one more qualified than Texas Dental Specialists to do the general dentistry work that you need – whether it’s a simple extraction or filling, or a complete mouth reconstruction. Don’t put off seeing the dentist – problems found early and treated immediately usually cost less and eliminate future dental pain that no one wishes to experience. We look forward to welcoming you to our dental family. We look forward to solving all of your general dentistry needs.